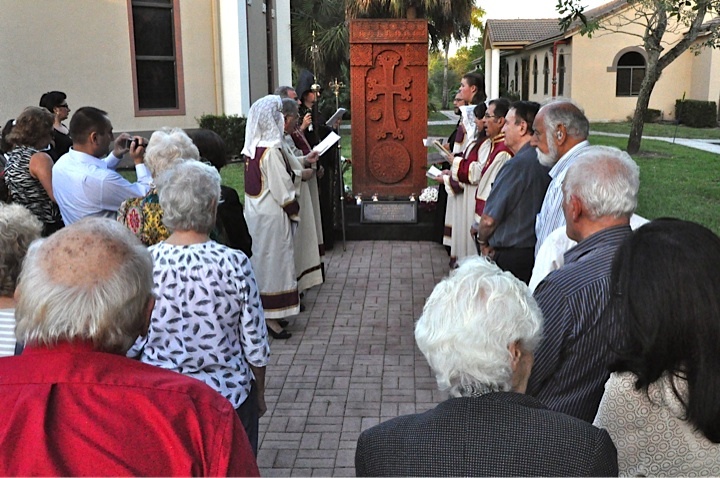 HOLLYWOOD, FL —On Wednesday April 24, several hundred members of the South Florida Armenian American Community gathered at St Mary Armenian Church to commemorate the 98th anniversary of the Armenian Genocide, reported Florida Armenians (FLArmenians). The evening began with a hokehankist (memorial service), which was offered for the victims of the Armenian Genocide by the V. Rev. Fr. Nareg Berberian of St. David Armenian Church and Rev. Fr. Vartan Joulfayan of St. Mary Armenian Church. After the service, a cross-cultural, multimedia program began delving into the history surrounding the Armenian genocide, as well as the emotions that are shared not only by the survivors and descendants of survivors, but also the survivors of many of the numerous other genocides of the 20th century. Armenians worldwide commemorate the genocide on April 24 of each year, the day when, in 1915, Ottoman authorities arrested 250 Armenian intellectuals and community leaders in Constantinople. Soon after, the Ottoman military ripped Armenians from their homes and began a systematic extermination of Armenians which was implemented in two phases: the killing of the able-bodied male population through massacre and forced labor, and the deportation of women, children, the elderly and infirm on death marches to the Syrian Desert. The total number of Christian Armenians who perished as a result between 1915 and 1923 has been estimated at around 1.5 million. The Turkish government has yet to formally acknowledge that the genocide even occurred. As the program continued, Mr. Harry Pilafian, a survivor of the genocide who was in attendance, was recognized with standing applause. Lilit Mnatsakanyan and Tanya Lusararian read papers they had composed regarding their perspectives on the genocide, and Roubina Majarian of St David Armenian Church presented Armenian poetry. Guest speaker Professor Hannibal Travis of the Florida International University (FIU) College of Law addressed the audience about his ongoing study of the Armenian Genocide, particularly how it has been addressed by the United States. Professor Travis is the author of the first comprehensive history of physical and cultural genocide in the Middle East and North Africa, entitled Genocide in the Middle East: The Ottoman Empire, Iraq, and Sudan. A short screening from the documentary “Orphans of the Genocide” was also presented by south Florida film producer Bared Maronian. A musical interlude followed, with Alique Mazmanian performing “Karouna” by Komitas on piano, Mrs. Audrey Pilafian performing “Manoushak” and “Yeraz” on cello, Joseph Yenikomshian playing “Lord have mercy” on clarinet, and Sage McBride performing “Krounk” by Komitas, on violin. Before the conclusion of the program, Mr. Yaghdjian unexpectedly once more approached the podium to excitedly say, “I was just given a note that the Florida State Senate just passed a resolution recognizing April 24 as Armenian Martyrs Remembrance Day for the first time in Florida history,” to a round of thunderous applause. 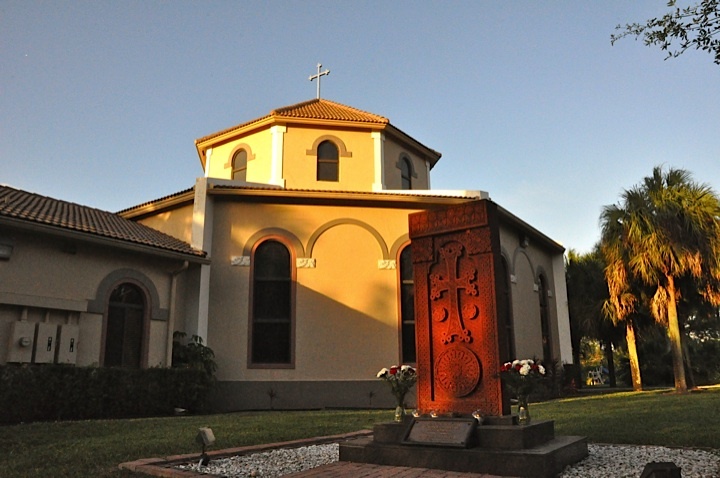 The South Florida Armenian Genocide Commemoration was held under the auspices of St. David Armenian Church of Boca Raton, St. Mary Armenian Church of Hollywood and Florida Armenians, together with the Armenian Assembly of America, the Armenian National Committee, and the Knights of Vartan. Photo Caption 1: St. Mary Armenian Apostolic Church of Hollywood, Florida. Photo Caption 2: Florida Armenians joined by human rights and anti-genocide activists to commemorate the 98th anniversary of the Armenian Genocide and all genocides of the 20th Century. 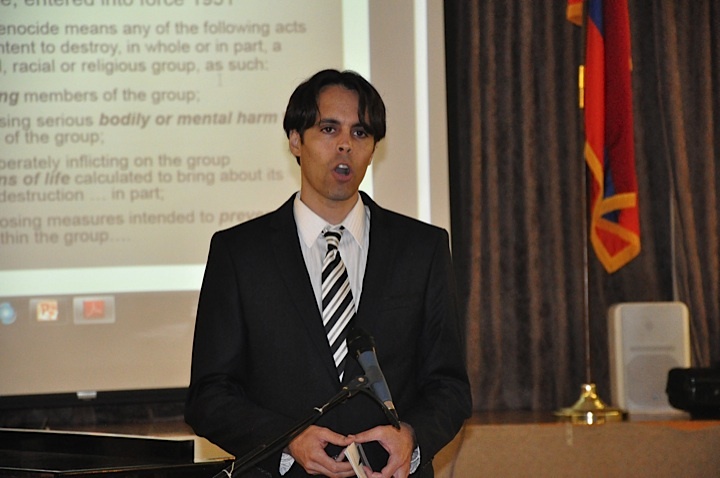 Photo Caption 3: FIU Professor Hannibal Travis presents his studies on the Armenian Genocide. 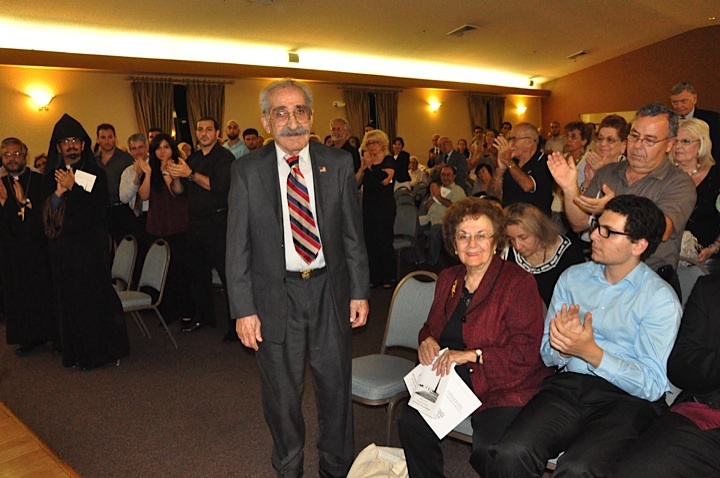 Photo Caption 4: Armenian Genocide survivor Harry Pilafian recognized by South Florida Armenian American community. Photos courtesy of Michele Kevorkian McBride for FLArmenians.com.